Bartender Karen Grill adds her own culinary touch to Sassafras cocktails. 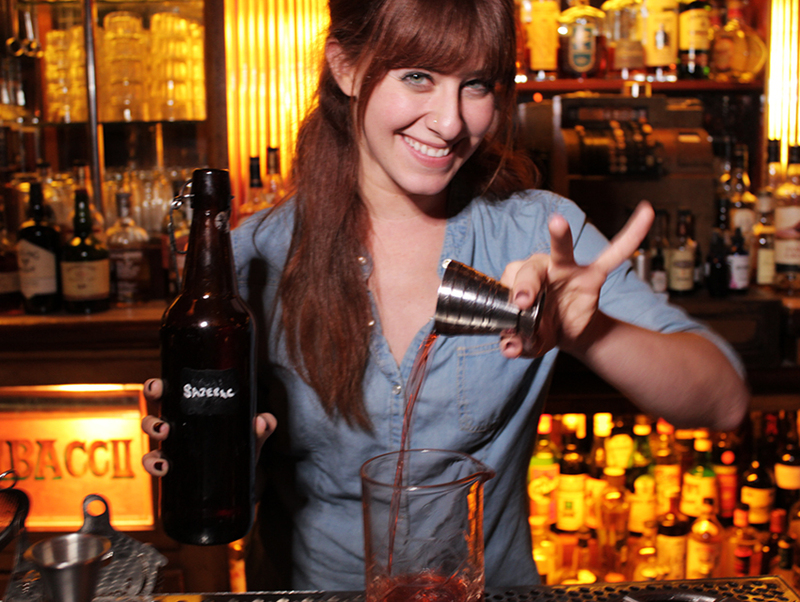 Sassafras bartender Karen Grill is a foodie in the best sense of the term. She can’t stop, won’t stop learning about food and drink. While working at Bestia, Grill jumped in on a lesson led by executive chef Ori Menashe about how to break down a pig. She’s also such a huge beer geek that she had to become a first-level cicerone. Needless to say that everything she deems tasty and interesting will inevitably find its way into her cocktail programs. And we all win. After learning from one of the best in the cocktail biz, bartender Julian Cox, Grill went on to work at Sotto, Playa, and then Bestia. It’s no wonder that she’s won recognition, like being named one of America’s Top Bartenders of 2014 by Spirit magazine as well as Los Angeles’ “Most Imaginative Bartender” in 2013 by Bombay Sapphire and GQ magazine. Grill has since gone on to apply her talents to places like The Churchill and has recently revamped the cocktail program at 1933 Group’s Sassafras in Hollywood. I had a chance to ask her some questions as part of our recurring Q&A series with L.A. bartenders. Here are her quick answers. What’s a popular drink at your bar? What’s the best night to go to your bar and why? The next big thing in cocktails is_____? Where do you like to drink in L.A.? Where’s your favorite place to eat in L.A.? What do you like to drink when you’re not working (doesn’t have to be cocktails)? Previous articleWhere the Chefs Will Eat During DineL.A.